1988 1995 - Chair for the establishment of the first collective Print Workshop of the Association in Iceland. 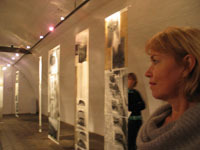 USA Sensory Experience, An international print exchange portfolio (20 artists),Ingham Chapman Gallery, The University of New Mexico, Gallup, New Mexico. - "The Impact of education through printmaking" - an introduction of The PA&R program.